36. Steam engine at work. 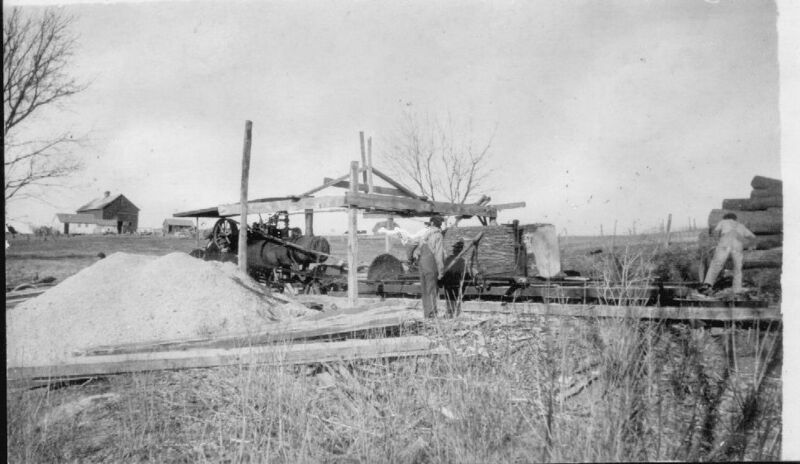 After going through the binder,(described on photo 45) being shocked, and put on a wagon, the driver would go to the thrashing machine and pitch the shocks of wheat into the machine headfirst. The thrashing/threshing machine would separate the grain and expel the straw. 37. 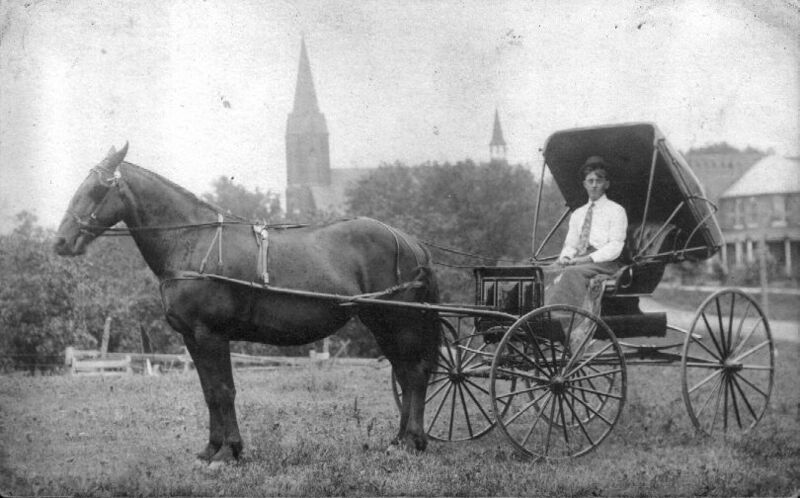 Joseph Nanneman's horse and wagon in Schumacher's yard. Joe eventually married Margaret/Maggie Huber. 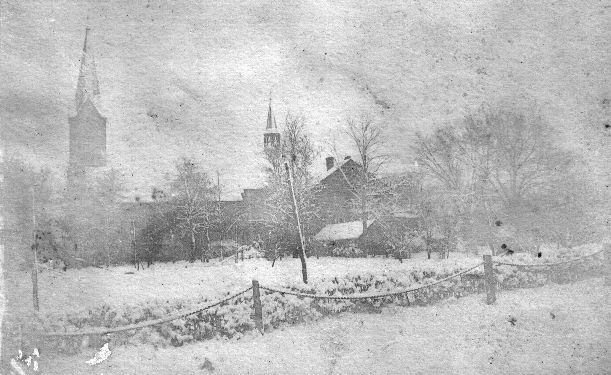 (Same photo was in Nanneman/Huber collection) Church is in background. 38. Mike Huber's home. Pictured are _____ ____. House was designed and built by John Meinhardt in ____. Later John reshingled the room and made a comment to Mike's niece about the "darn fool" that designed the difficult to shingle round part of the house. 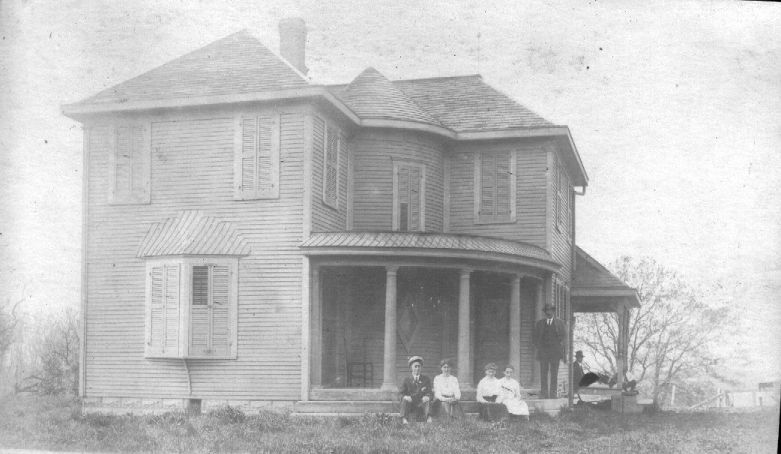 John didn't know that Mike's niece, Mary Catherine Huber (Noll), knew exactly who had built the home. 39. 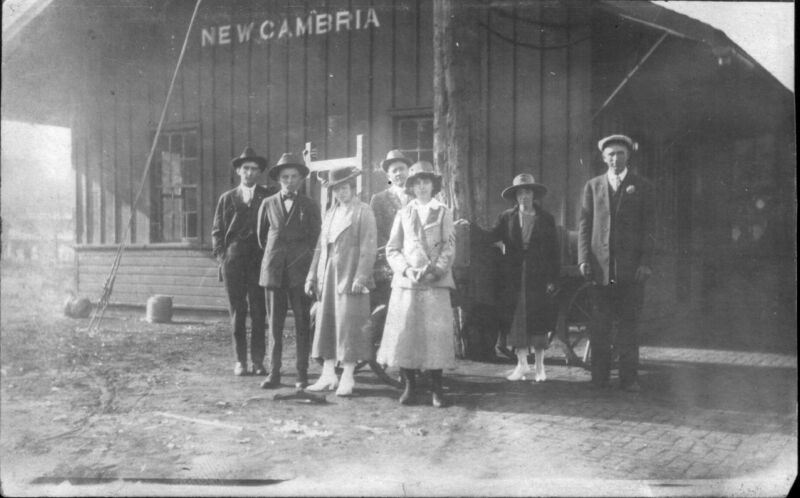 New Cambria Train Station. Thanks to Cletus Steffes for identifying the group which includes(from left): Raymond King, Leonard King, Nora Ables, Joe Stoll, Rose King (Cletus Steffes' Mother), Regina Ables, and Joe Leifgen. Cletus tells me that they came to a wedding for Regina Leifgen and John Ley. Cletus' mom and dad met at this wedding,and began a long distance romance. They were married about six years later. 40. 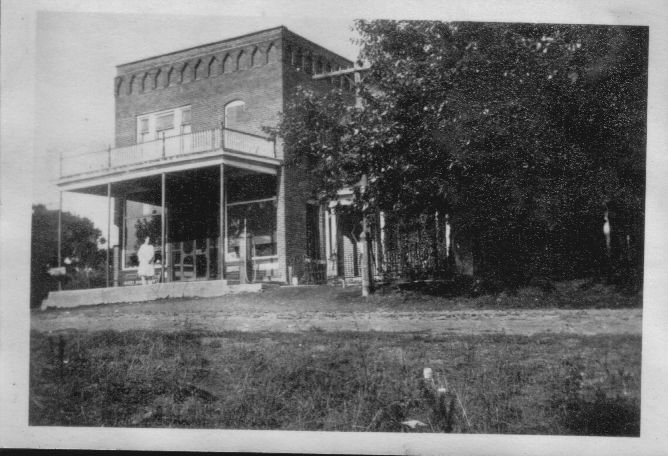 Front of Schumacher Store after electricity and tree growth. 41. 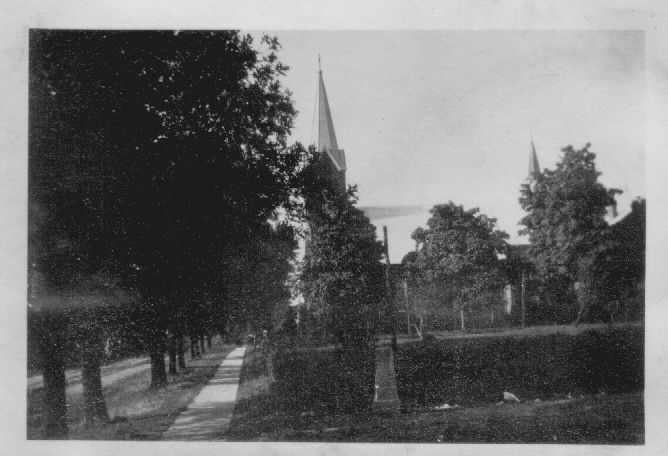 St. Mary's Church viewed from Will Becker's at Schumacher Store. Short concrete pillar to the right of the sidewalk is the "hitching post". 42. 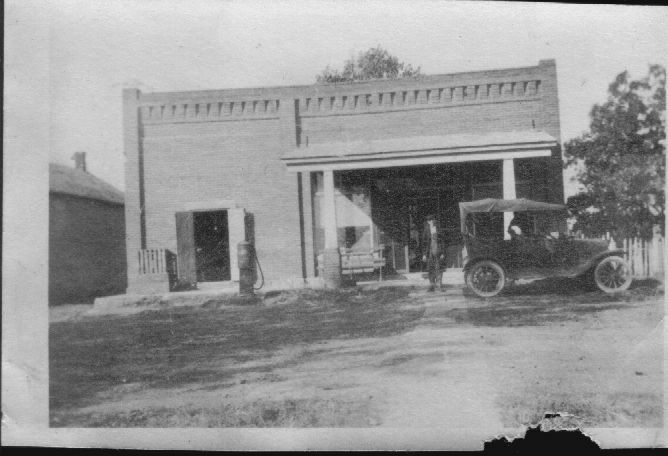 The "new" Steffes Store with lone gas pump. 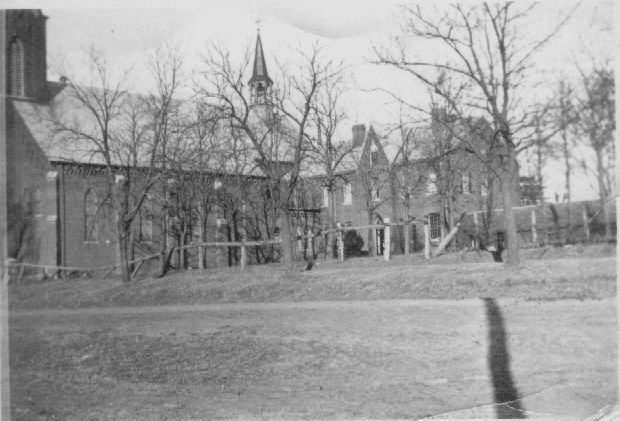 The building to the left is the original wooden structure which was rolled on logs to the south to make way for the brick store. 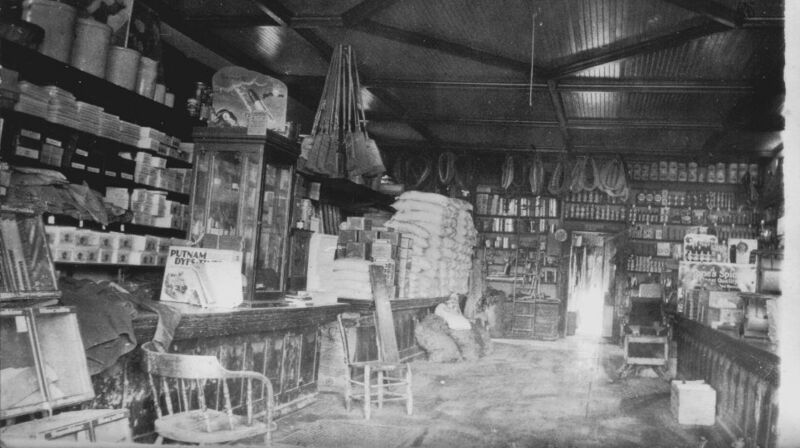 The present "feed" building is the original store. 43. The monastery adjoining the church. 44. The north and east wall of Schumacher's Store. 45. 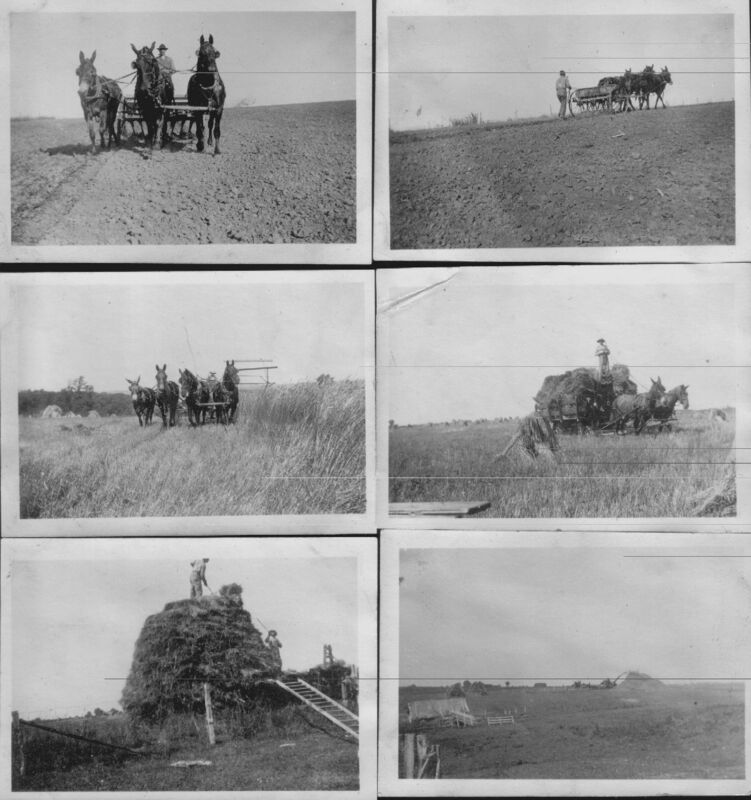 Horse and mule plow team driven by owner, A.C. Fessler. He is riding a drill, sowing wheat.The photo below this is not identified for sure, but they are using a binder that cuts, gathers and ties the wheat into bundles to be shocked. 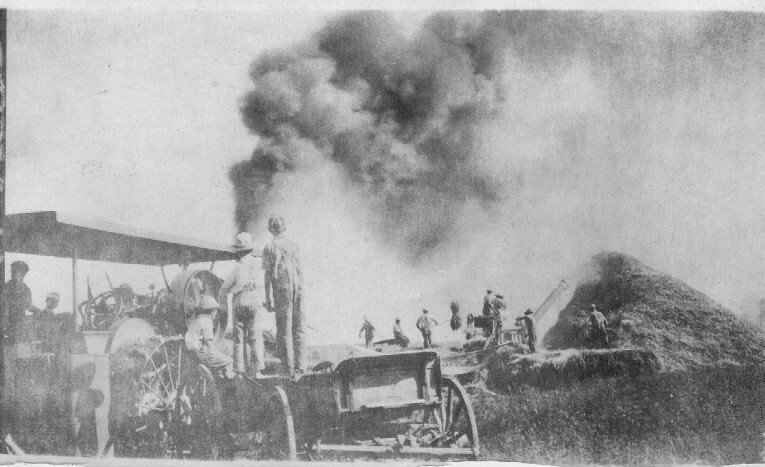 After this, the "spike pitcher" throws the bundles up to a driver and team, who takes the bundles to the "thrashing machine" pictured on the last photo and on photo 36. 46. Meinhardt sawmill located on Steffes property north of Wien. The photo is looking toward the south, showing Highway 129. The nearest house with pine trees in front is John Steffes' house, and the next is Tony (Tobe) Fessler's house, located on what is now the Chuck Nanneman property. 47. Meinhardt sawmill. June and Bill Meinhardt are pictured. 48. 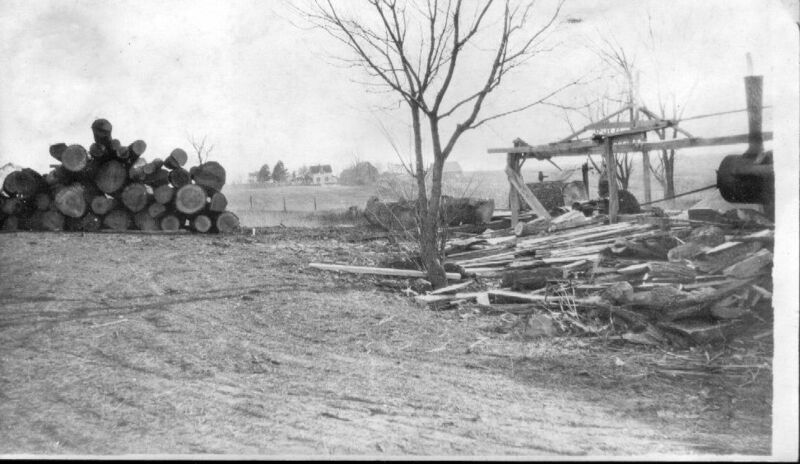 Close-up of sawmill operation. 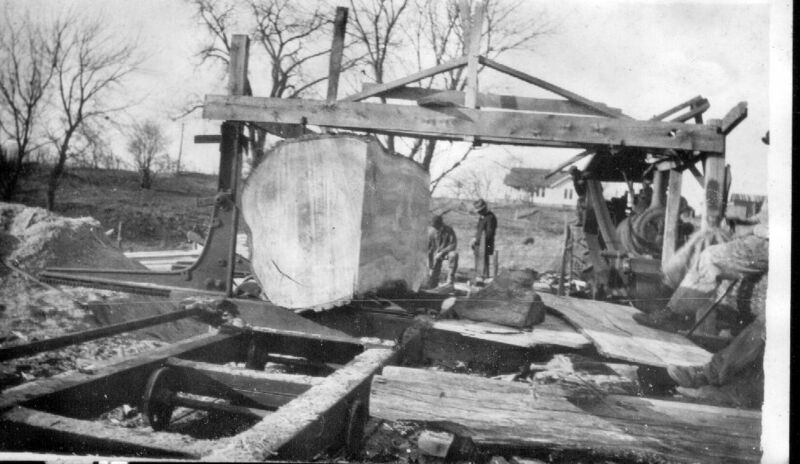 Behind the picture of the big log being sawed is Fred and Rose Steffes' farm. The photo is looking toward the north. 49. View of Wien Church and Monastery during a snowstorm. 50. 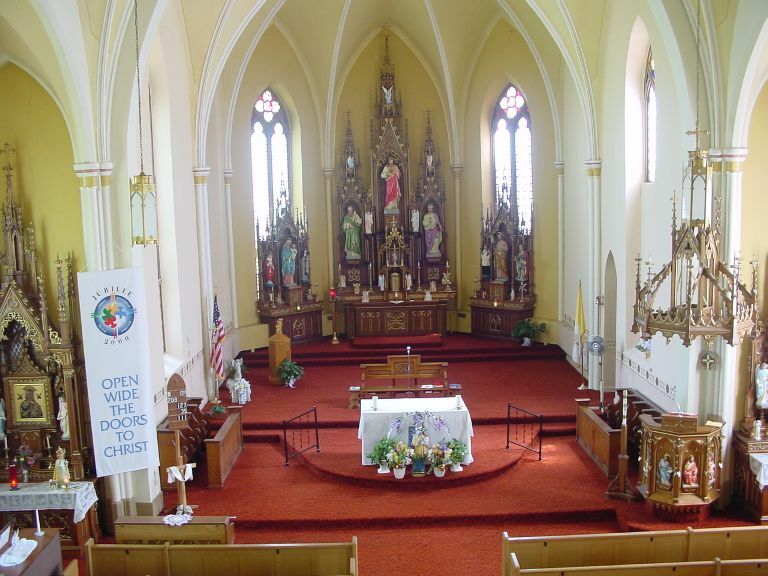 Inside of Wien Church 2002, showing high vaulted ceilings. 51. Big Bell in the St. Mary's Bell Tower. Her name is Elizabeth because she was donated in honor of Elizabeth Peters and dedicated in honor of _______. 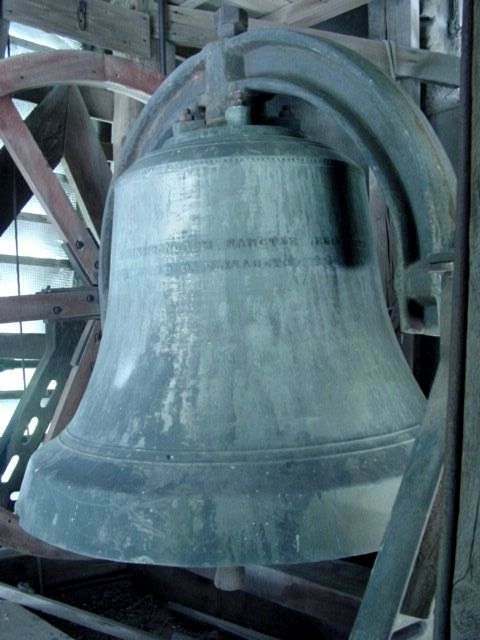 More information about the bells can be found here. 52. 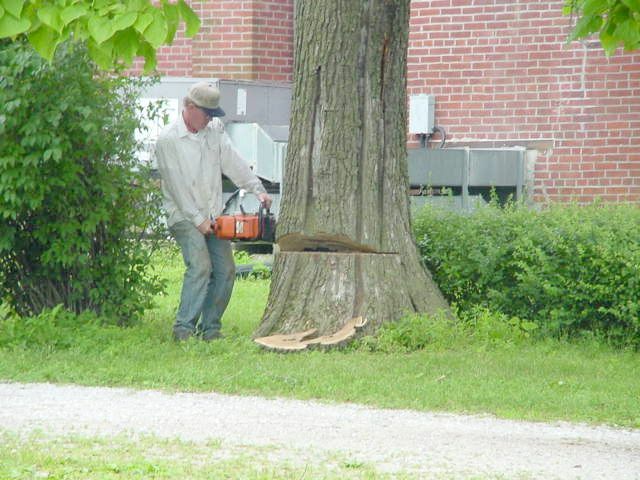 2002 cutting of the trees on the north side of the church.